ISTANBUL, Aug. 20 (Xinhua) -- Turkish President Recep Tayyip Erdogan said on Monday that the attack directed against Turkey's economy is no different from a strike against its flag or call to prayer. "The purpose is same. 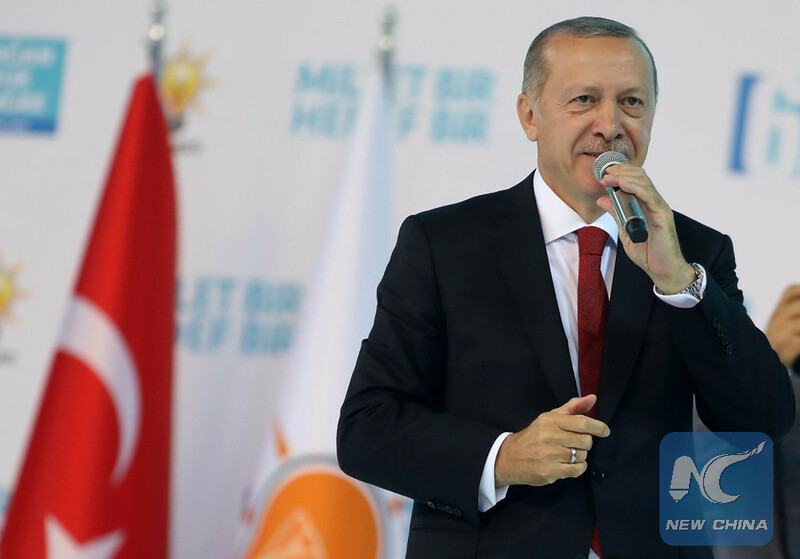 The purpose is to bring Turkey and its nation to their knees, and hold them captive," Erdogan said in a televised address to the nation to mark the Eid al-Adha festival, which starts on Tuesday. "Those who tried to make Turkey bow before them by using terror groups, traitors and plots will soon see that Turkey will not give up," the president stressed. He added, "Those who think they can make Turkey give in with the exchange rate will soon see that they are mistaken." The Turkish lira sank rapidly against the U.S. dollar after Washington imposed economic sanctions on Turkey on Aug. 10 over Ankara's continued detention of American pastor Andrew Brunson. Turkey responded by increasing tariffs on U.S. products such as cars, alcohol, and tobacco, in a development that has further chilled an already strained relationship between the NATO allies. A Turkish court on Friday rejected the second appeal for the release of Brunson from house arrest during his trial. The pastor has been accused of espionage and terror-related charges over alleged links to a network led by the U.S.-based Turkish cleric Fethullah Gulen and the outlawed Kurdistan Workers' Party. Washington has threatened more punitive moves against Ankara over its refusal to free Brunson.